French and Haitian women both played large parts in the revolutions though the ways they participated were often very different from the men. Women in France took it upon themselves to lead marches and other protests. The French women mostly participated in non-violent types of protest and focused on changing the minds of people or influencing the men. For example, it was women who marched on Versailles in order to bring the royal family back to Paris so that a close eye could be kept on them. Haitian women would use the system in place to aid the revolution in whatever ways they could. This meant that they would often use their sexuality to gain access to the whites so that they might have control over their own people or influence the white men. Women were also knowledgeable about the land and resources and so they could provide care as nurses, guides, or suppliers. There were also reports of women participating in combat during the siege of Crête à Pierrot. It is interesting to see that both French and Haitian women used the ideals that men had about them in order to help the revolutions. Both of these groups of women felt the need to participate in the revolutions because they lacked rights and wanted to help make a change, not just for themselves but for others in society as well. 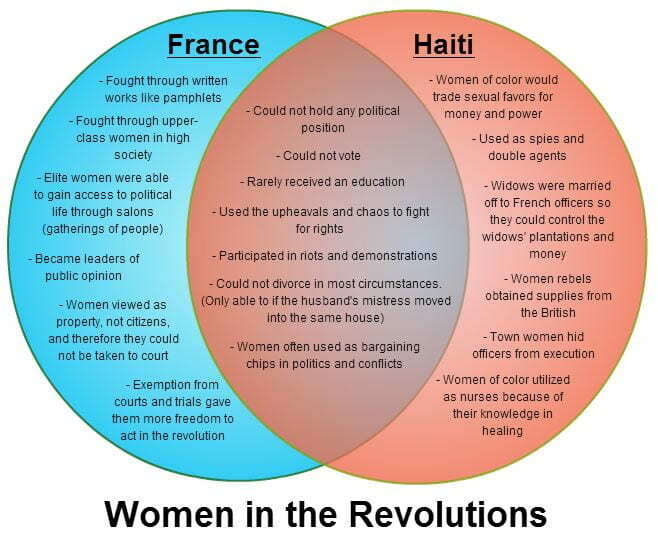 Venn Diagram comparing women of the French and Haitian Revolutions.